Hakuho s’est montré expéditif pour vaincre Chiyoshoma et obtenir sa 1046ème victoire de carrière. 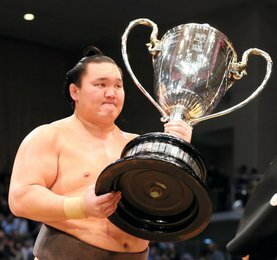 Le yokozuna Hakuho a remporté sa 1 046e victoire mardi en battant Chiyoshoma. Le grand champion préserve son score parfait ainsi que sa place de leader. Avec cette 10e victoire, Hakuho (10-0) passe devant de record du yokozuna Chiyonofuji et n’est désormais plus qu’à une victoire pour égaler celui de l’ancien ôzeki Kaio. 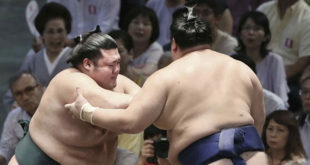 Après un faux départ de Chiyoshoma (4-6), Hakuho a absorbé la charge du maegashira 5 avant de l’attraper à la ceinture et de verrouiller son bras pour le conduire hors du dohyo. Demain Hakuho cherchera à égaler le record de Kaio en affrontant le nouveau sekiwake Mitakeumi contre lequel il a déjà perdu une fois en cinq rencontres. Mitakeumi (7-3) a vaincu le maegashira 1 Shodai (3-7) avec un jet de bras. Le maegashira 8 Aoiyama reste sur les talons de Hakuho avec un excellent 9-1 après avoir battu Chiyotairyu (7-3). Trois lutteurs occupent la troisième place du classement : l’ôzeki Takayasu et les maegashira Onosho et Takarafuji. Takayasu et le maegashira 4 Ura (6-4), qui a triomphé lundi de Harumafuji (7-3), ont sans doute livré le combat le plus intéressant de la journée. 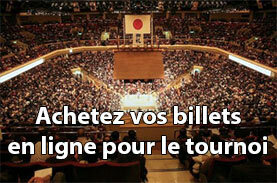 Du haut de ses 1,86 mètre l’ôzeki a repoussé les nombreuses attaques d’Ura qui s’est efforcé à plusieurs reprises de foncer sur Takayasu mais sans succès. Onosho a vaincu Tokushoryu (3-7), tandis que Takarafuji a battu le géorgien Gagamaru (3-7). Dans le dernier match de la journée, Harumafuji a dominé Tamawashi (5-5) au bord de l’anneau, incitant le sekiwake à sortir. Yokozuna Hakuho collected his 1,046th career win Tuesday as he edged rank-and-file grappler Chiyoshoma to stay perfect at the Nagoya Grand Sumo Tournament. The Mongolian grand champion notched his 10th win in as many days of the 15-day tourney to grab sole possession of second place on the all-time ranking, surpassing late yokozuna Chiyonofuji and moving within one of former ozeki Kaio’s record. 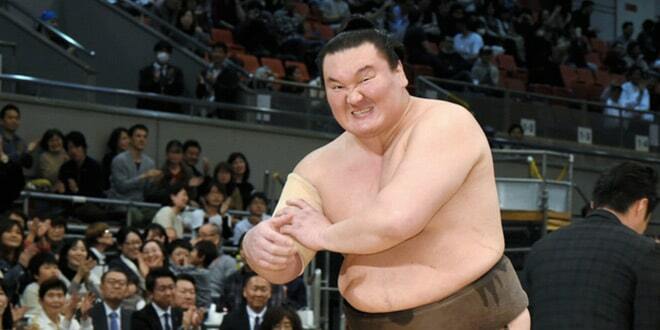 After a false start by Chiyoshoma, who used to train under Chiyonofuji, Hakuho absorbed the No. 5 maegashira’s charge and caught him in an arm lock. The yokozuna then grabbed his opponent’s belt with both hands before driving him off the dohyo and to his sixth loss at Aichi Prefectural Gymnasium. Hakuho’s head-to-head with his countryman now stands at 2-0. Hakuho, who has a record 38 career titles, will seek to tie Kaio’s mark on Wednesday when he meets sekiwake Mitakeumi, against whom he has a 4-1 record. Mitakeumi (7-3) on Tuesday pulled down top maegashira Shodai (3-7) with an underarm throw. Bulgarian eighth-ranked maegashira Aoiyama remains on the heels of Hakuho at 9-1 after powerfully thrusting out No. 10 Chiyotairyu (7-3). Three others — ozeki Takayasu, No. 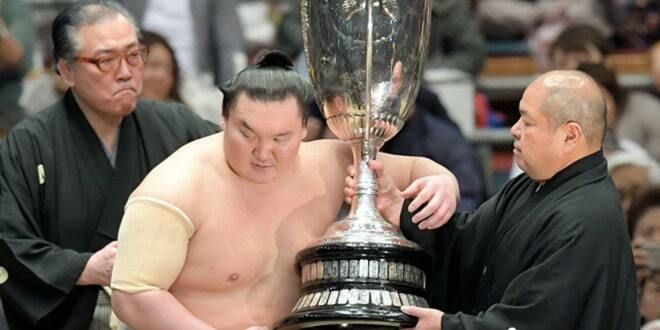 6 maegashira Onosho and 13th-ranked Takarafuji — beat their opponents to stay two wins behind Hakuho. Takayasu and No. 4 maegashira Ura (6-4), who upset yokozuna Harumafuji (7-3) on Monday, put on what was perhaps the day’s most entertaining bout in their first career meeting. 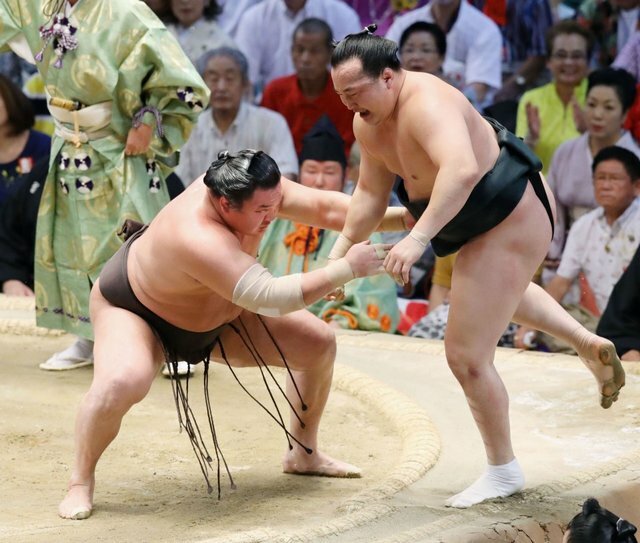 The ozeki, standing 1.86 meters tall, easily fended off the 1.74-meter Ura’s charges, repeatedly shoving him away by some distance before twirling him off with a neck throw with his right arm. Onosho defeated ninth-ranked Tokushoryu (3-7), while Takarafuji beat Georgian No. 16 Gagamaru (3-7) with a twisting overarm throw. In the day’s last match, Harumafuji bulldozed fellow Mongolian Tamawashi (5-5) to the edge of the ring, prompting the sekiwake to step outside.